Need more information about booking Home 2522952 ? In the beautiful island of Paros, and more specifically in Aliki, we have created the Paros Afrodite Luxury Villas . 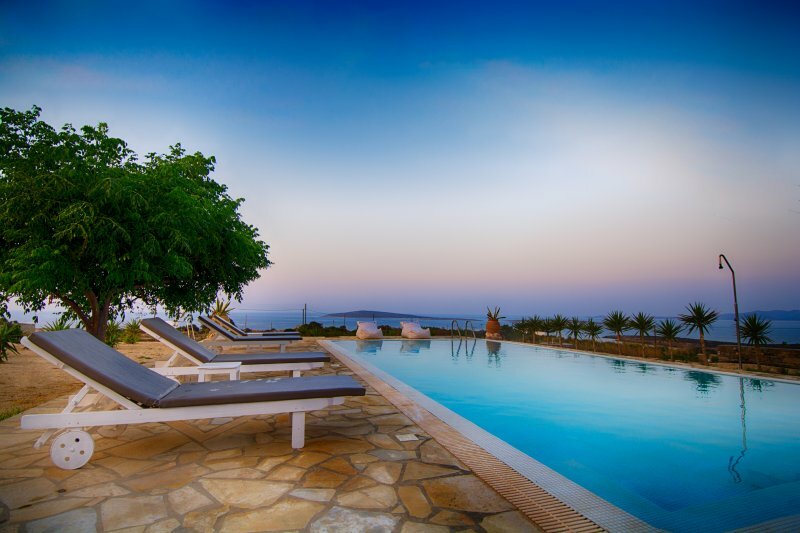 This beautiful building is situated on a hilltop in Aliki offering panoramic view of the Aegean Sea. It is the ideal place to enjoy that view of Antiparos, Aliki and the neighboring islands. The villa has 3 separate buildings with total guests 15 persons and is very convenient either for 2 or 4 or 6 or 8 or 10 or 12 or 15 persons. The main building has three bedrooms , three bathrooms, two kitchens and a big living room with all the facilities. The second building has two bedrooms , one bathroom and a kitchen with all the facilities and a sofa bed . It is the perfect choice for people who wish to relax, rest and enjoy the luxury that Paros Afrodite Luxury Villas offers. The villa extends in an area of 10 acres offering visitors the comfort they need, as laurels surround it. Ideal location for a wedding event, a christening party and of course of a wedding stay. This building is located at a distance of 150 meters from the beach of Agios Nikolaos, Aliki and 500 meters from the central beach of Aliki. You can reach the villa easily on foot or by car. You can get in touch with Aikaterini (the owner) through the contact form on this page. Send Aikaterini (the owner) an email through the contact form on this page. Alternatively, if there’s a phone number on this page, you can call them. How do I contact Aikaterini (the owner)? If you’ve already booked, go to Manage your holiday booking to view Aikaterini the owner's contact details or send them a message. Or send Aikaterini (the owner) an enquiry through the Contact the owner/manager form if you’d like a quote or more info first. When you pay online through the Book your stay form, a booking request is sent to Aikaterini (the owner). You’ll find out within 24 hours whether they’ve accepted - no money will leave your account before then. You can also request a quote from Aikaterini (the owner) through the contact form. The owner will email you the total cost for your dates and a link to book and pay online. Use the Book your stay form to pay provisionally online. You can pay by credit/debit card or PayPal. Aikaterini (the owner) will have 24 hours to accept the booking and no money will leave your account before then. Why can't I call Aikaterini (the owner) before booking? You’ll need to contact Aikaterini (the owner) to do this. Send them a message in Manage your holiday booking or through the contact form on this page. You can request to change the dates or number of people on your booking via the Manage your holiday booking page. To change your holiday dates use the Edit booking button. If you need to change the number of guests staying then send Aikaterini (the owner) a message. If Aikaterini (the owner) agrees, they’ll send you a revised quote outlining the changes. You can review and accept/decline this from the Manage your holiday booking page. You’ll have 48 hours to take action before the revised quote expires.